Add all ingredients, with ice, to a cocktail shaker. 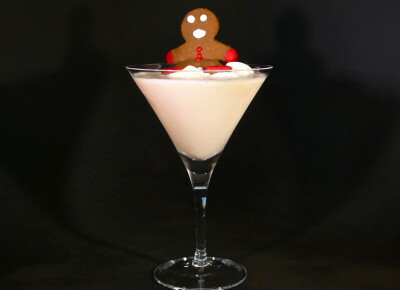 * Use Monin Gingerbread Syrup or see our Gingerbread Syrup recipe/video and make your own! This is one of the most delicious (and fun!) cocktails we make. A favorite of so many of our friends, we can make it in our sleep. In fact, Phil keeps the ingredients on his bedside table so he can whip up a drink in the wee hours without leaving his bed. You can watch us make our homemade Gingerbread Syrup, or you can seek out a commercial brand, like Monin (it is not expensive – see if your local coffee shop will sell you a bottle or look for it online). Whether you make you own or purchase a ready-made syrup, you will never regret it as this drink is amazing. 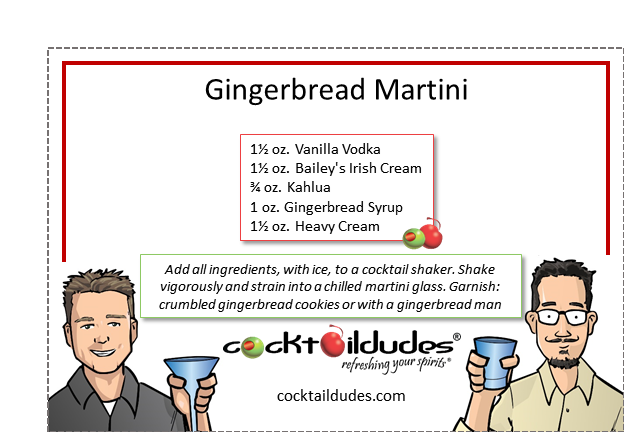 (Watch the video to see how we contort our gingerbread men in preparation for their baptism into this delicious cocktail.) Cheers!